A good garden variety with sweet musky flavour. An old Flemish variety raised by Fievee at Maubeuge, France before 1825. Medium sized, bergamotte shaped fruit. Slightly rough green skin turning yellow when ripe. Occasionally faint pink blush. 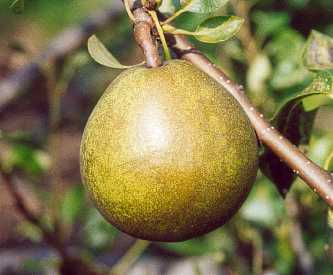 Patches of brown russet over most of the surface. White, melting flesh. Sweet with an excellent musky flavour. Small, spreading tree. Reliable, precocious, good to heavy cropper. Attractive red autumn foliage.